In the modern era, we are seeing a plethora of companies take their businesses to new markets. Additionally, we are seeing digital article or blog post content being written by freelancers that may be in different countries than their bosses. What transpires as a result is that a prospective manager has to ascertain how they are going to motivate their employees that may be in offices in different countries of their multinational corporation or freelancers who writing on behalf of their business all over the globe. This is something that is often not considered by managers. The reality is that if you are going to delegate your tasks to employees that are all over the world, you need to have time in your own busy schedule for effective communication. 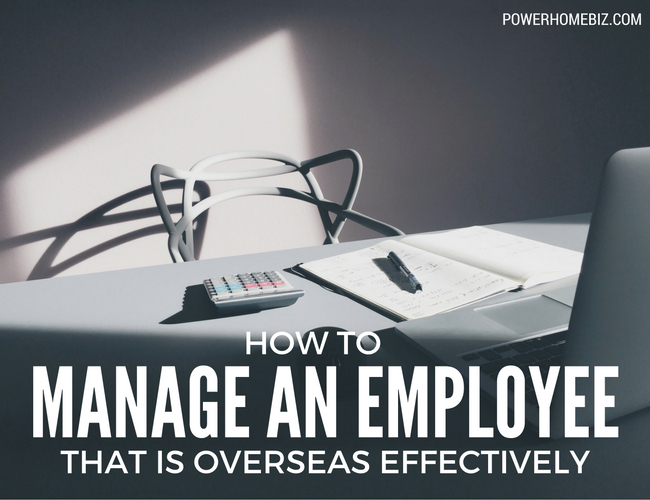 By doing this, you are actually saving yourself time later on because there will be less miscommunications on assignments that you have assigned to your overseas employees. When you are first starting your operations in another country, you may not be able to pay the best salary possible. That being said, if you would like to attract employees that are dedicated and hardworking, you will need to provide alternative benefits that will be valuable to them but less costly for you. An example of such benefits would be related to giving employees lucrative bonuses or vacation packages. Additionally, special promotions on your products or gift sets would also be an attractive option. When you have employees that are both working on hourly priced contracts or fixed price contracts, do not be afraid to be overly clear and ask questions as they are working on the process. This is a great way to see if they employee is producing what you are looking for and also is a way to be more time efficient and save them from revising the entire assignment later on. Pertaining to instructions and milestones, be very clear with the employee because it will clear up any questions that they will have and will also promote efficiency within your organization. Hiring goal-oriented employees is crucial to the success of your business in a new market. Particularly, if you are unable to spend a great deal of time in your foreign office, it is imperative that you hire employees that are going to be motivated by their own financial or educational objectives because the reality is that it is very difficult to motivate employees in foreign offices that are not motivated by their own causes. When operating a foreign office with many employees who do not have English as their native language, consider that you should hire a manager who speaks that language to assist you with your office operations. Additionally, if you are operating offices within the Arabic-speaking or Spanish-speaking world, it is best to hire a manager who speaks the dialect of Arabic or Spanish that is spoken by the majority of your staff. This way, you will be promoting effective inter-office communication and avoiding misunderstandings that could be detrimental to your business. Paying an employee’s salary on time gives him a sense of security. When you miss out on a payment, or intentionally delay it, it causes major worry. Especially if that employee is located in a third-world country and has no saving or excess cash to support his family with besides the salary you pay him. Not only it is inhumane and illegal to delay salaries beyond a certain time frame which (differs between countries), it is also counter-productive. Negative feelings and financial uncertainty have a major impact on productivity. Along the same lines of the same point, it will be recommended to pay any overseas employee with the domestic currency used in the country he is residing in. Paying with foreign currency can cause financial uncertainty (the employee will be dependent on the current exchange rates). It will be also costly to exchange the funds. You as an employer can use companies such as World First Currency Transfer that deal with overseas payments (but cheaper than banks), and your employees can also use it to receive funds (depending on where they live). In this ever-globalizing business economy, it is wise to consider effective ways to manage your overseas employees effectively. Given the increase of freelancing opportunities for employers to hire unique talent from all over the globe, one has to adapt their traditional business management practices to be effective in this new human resources employer – employee relationship model that is becoming more and more common by the day. By doing this, you will subject your company to be benefited by talented employees that you would have never had access to if you had not opened offices in foreign locales and freelancers that could enhance the content that your business produces in a spectacular way. By learning to keep these new employees around with effective managing skills, you will be doing your business a great service in the long run.